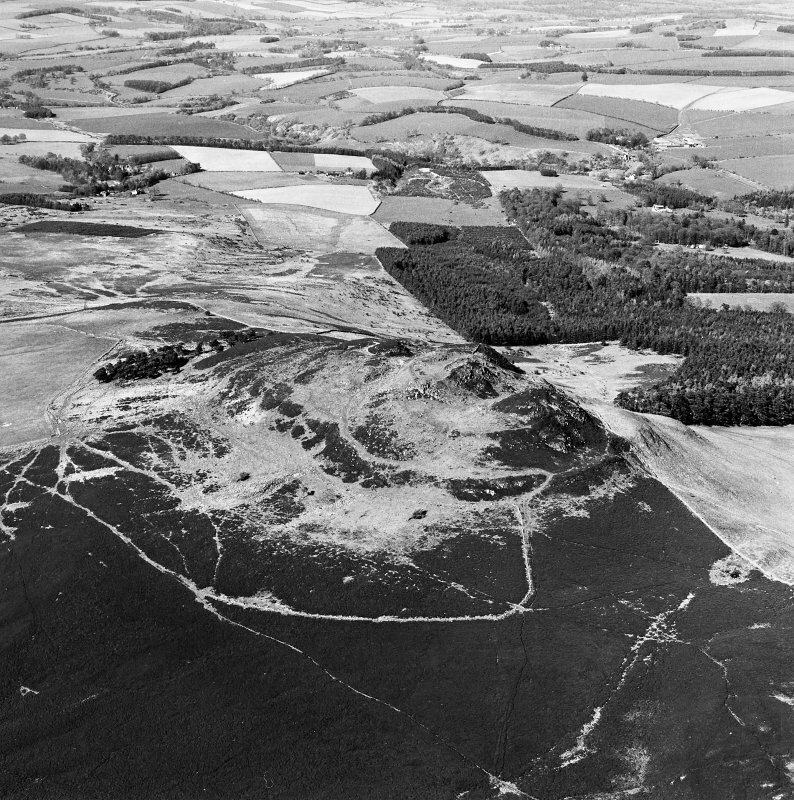 Rubers Law, oblique aerial view, taken from the NE, showing Rubers Law fort and roman signal station in the background of the photograph. 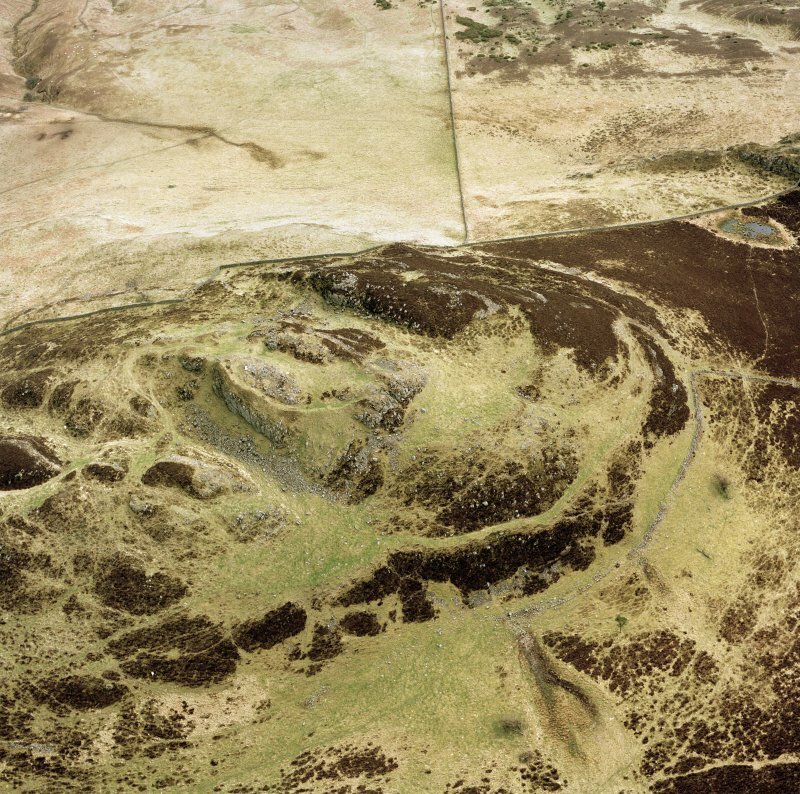 Rubers Law, oblique aerial view, taken from the NW, showing fort and roman signal station. 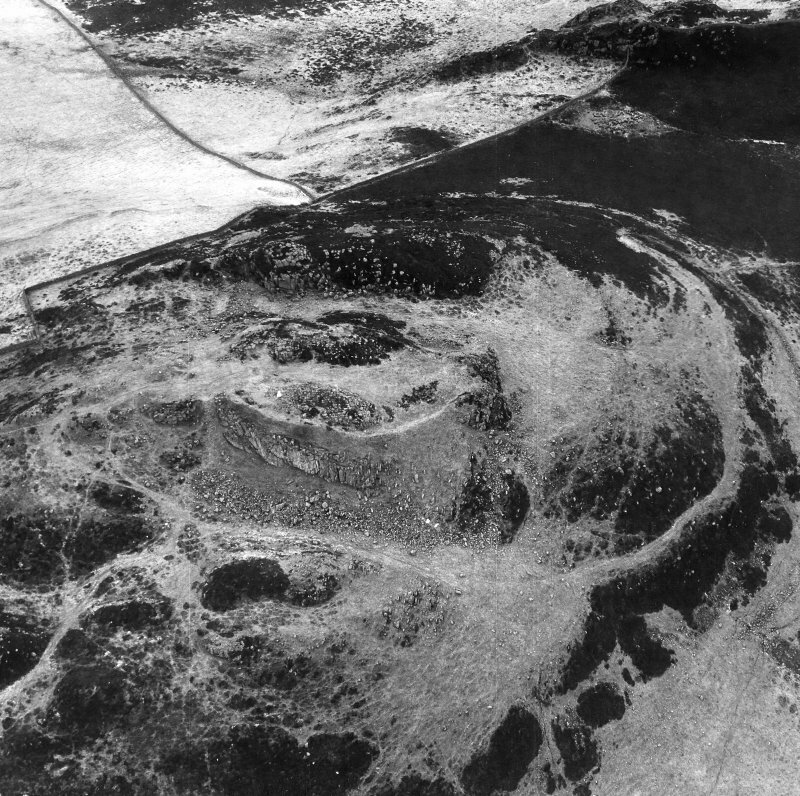 Oblique aerial view of the fort on Rubers Law, looking ESE. 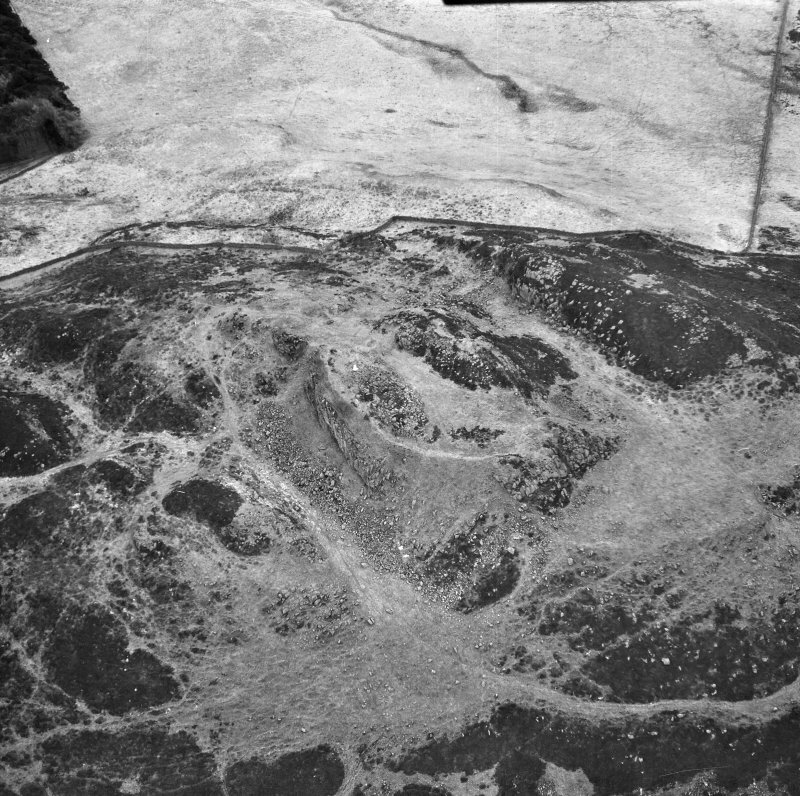 Oblique aerial view of the fort on Rubers Law, looking S.
Rubers Law, oblique aerial view, taken from the NE, showing fort and roman signal station. 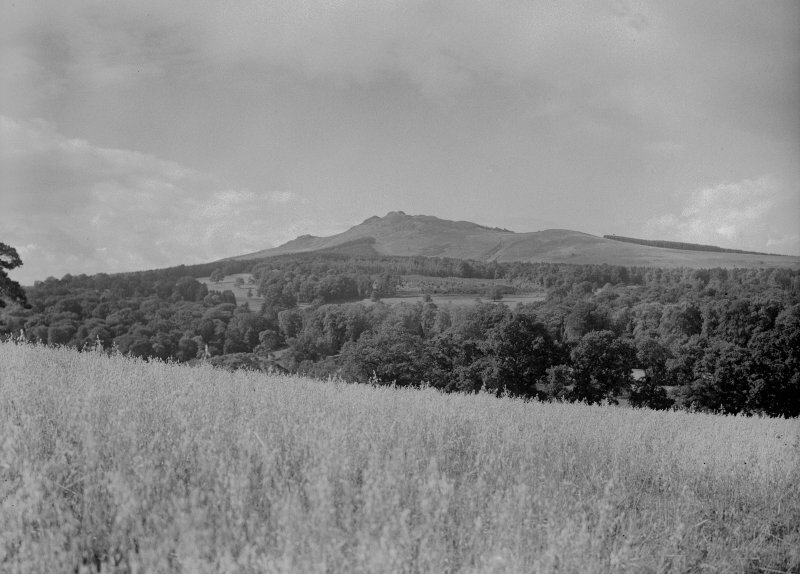 View of summit and triangulation pillar, with the Eildon Hills in the background. 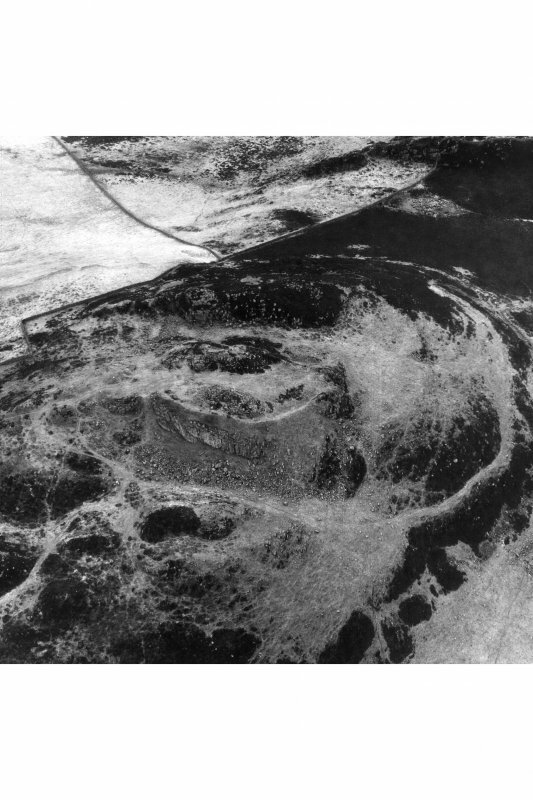 Oblique aerial view of the fort on Rubers Law, looking SSE. 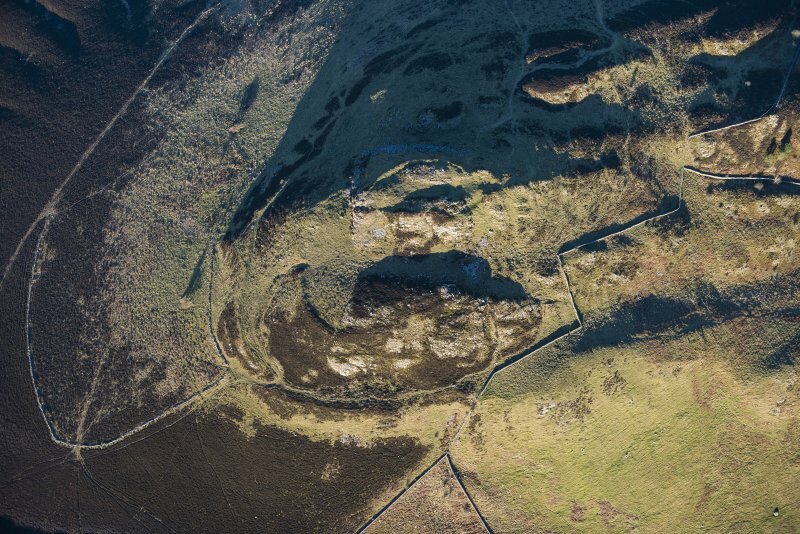 Aerial view of Rubers Law fort and roman signal station, taken from the E.
Oblique aerial view of the fort on Rubers Law, looking SSW. 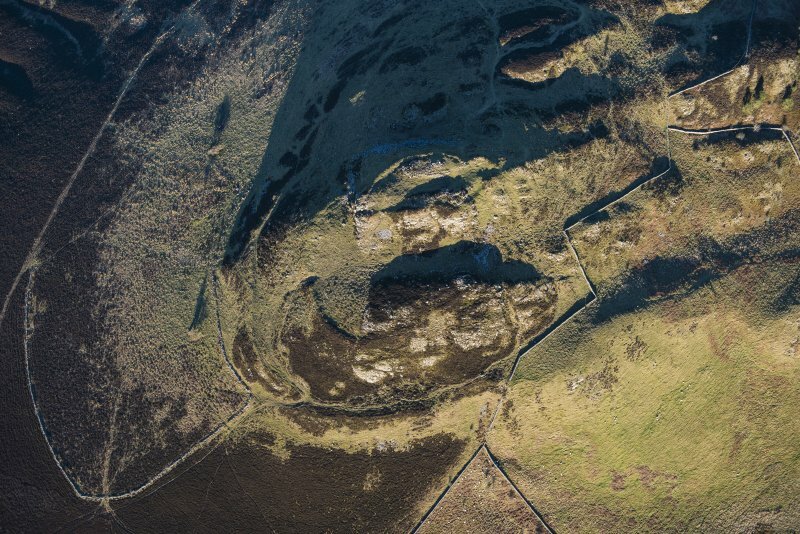 Aerial view of Rubers Law fort and roman signal station, taken from the SW.
Aerial view of Rubers Law fort and roman signal station, taken from the WSW. 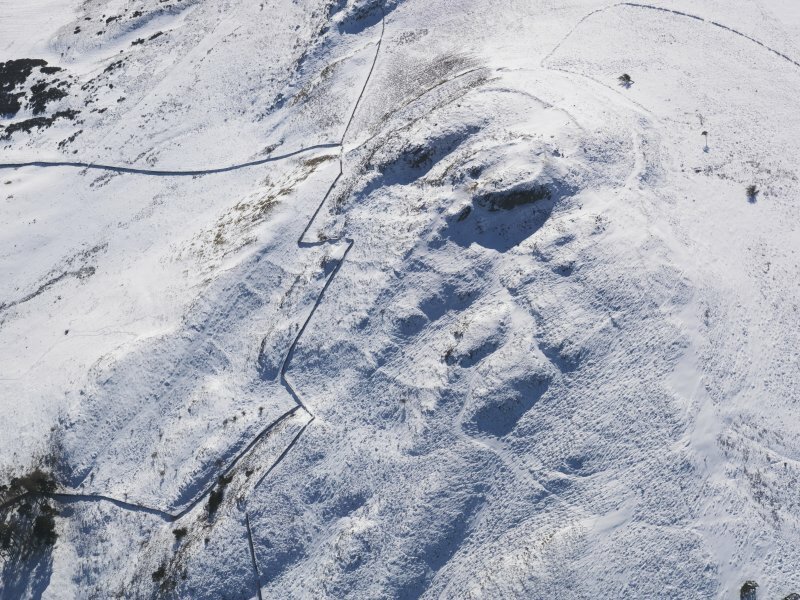 Oblique aerial view of the annexe immediately SW of the summit, facing NE. The entrance to the annexe is in the foreground. Rubers Law from NE, showing position of fort. 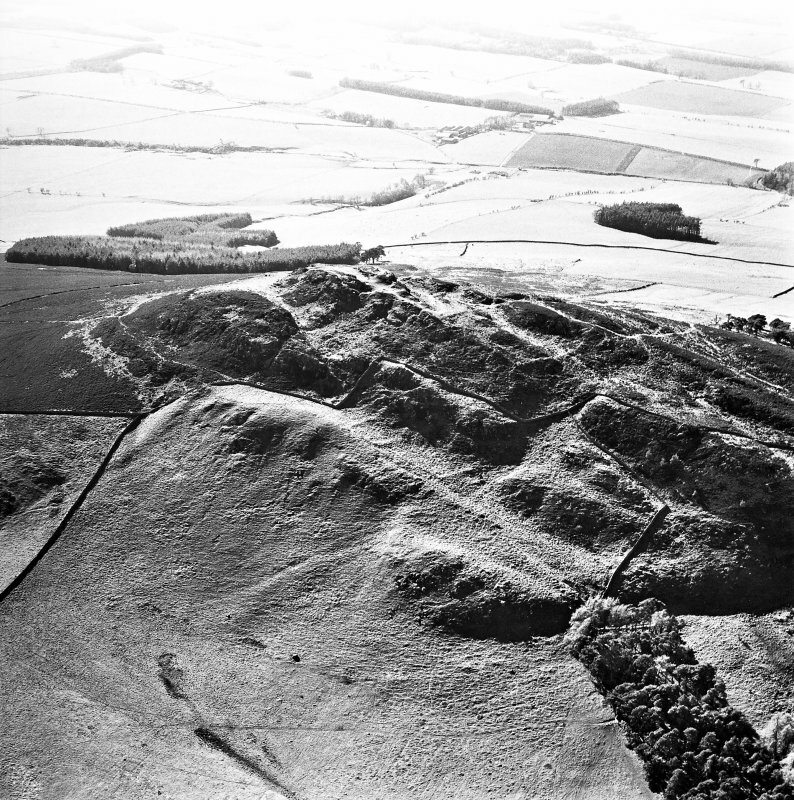 Oblique aerial view of the fort on Rubers Law, looking SW. 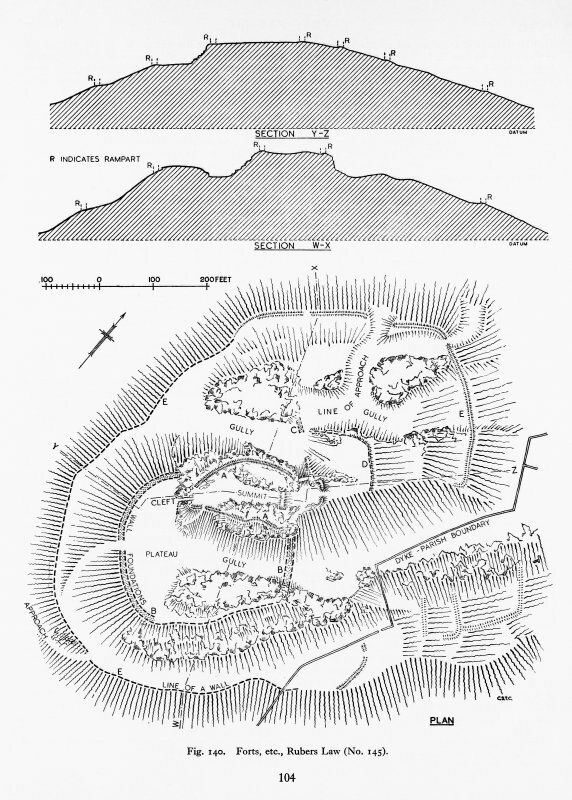 Publication drawing; plan and section of Rubers Law fort. 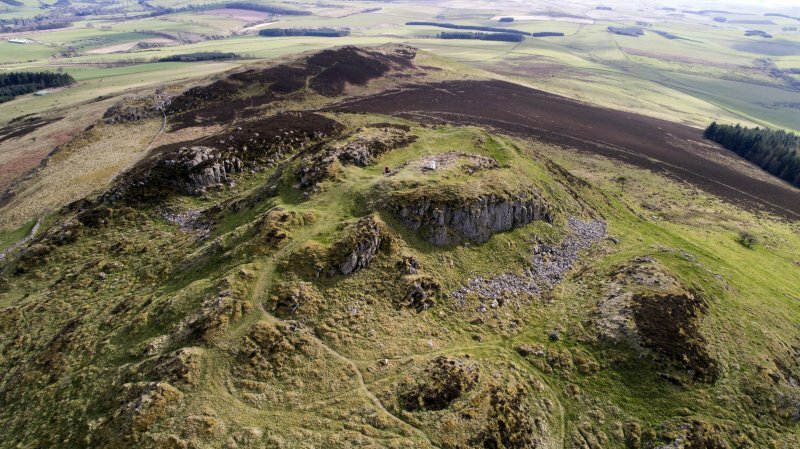 Forts and Site of Roman Signal-Station, Rubers Law. 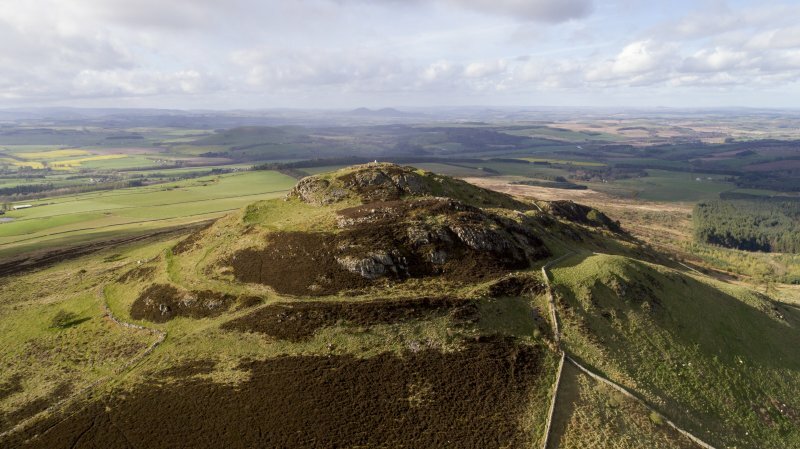 Rubers Law, on the borders of Cavers and Hobkirk parishes, is, after the Eildon Hills, the most conspicuous landmark in Roxburghshire. Rising to a height of 1392 ft. OD, it has a rugged and precipitous top composed of igneous rock largely bare of vegetation and much disintegrated, which has thrust its way through the strata of the Old Red Sandstone lying on the flanks of the hill. 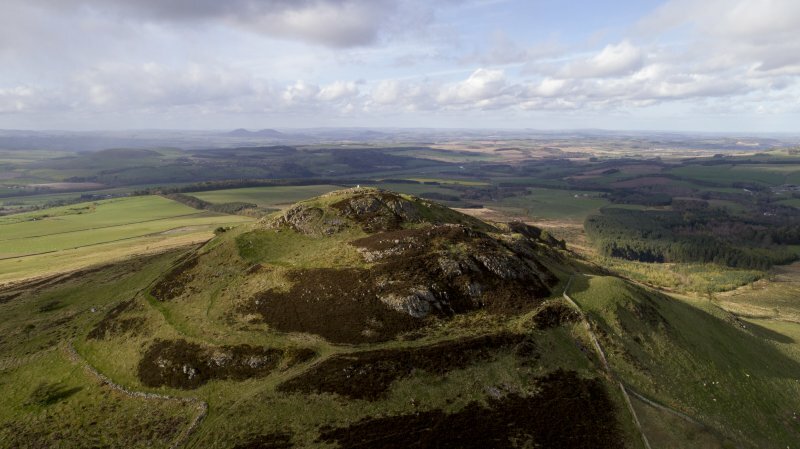 Being an isolated peak, it commands a magnificent prospect of the surrounding country as far as the Cheviot range on the S and E, the Eildons and Lammermuirs on the N, and the hills of Selkirkshire and Liddesdale on the W and SW. The principal features of the hill-top are: the summit, which is bounded on all sides except the NE. by precipitous cliffs 40 ft. to 50 ft. high; two lower hog-backed rock ridges lying respectively NW and SE of the summit and separated from it by large canyon-like gullies; a crescentic-shaped plateau which opens out from the SE gully at the S end of the summit; and, some 50 ft. below the level of the plateau, a natural terrace which encloses the hill on all sides except the NE, where the more gently inclined slope is broken by a series of parallel ridges running at right angles to the contours. A distant view is given in Fig. 489. (iv) an outer wall built on the edge of the natural terrace on the N, W, and S sides of the hill, and returning at approximately the same level as the terrace across the broken ground on the NE. 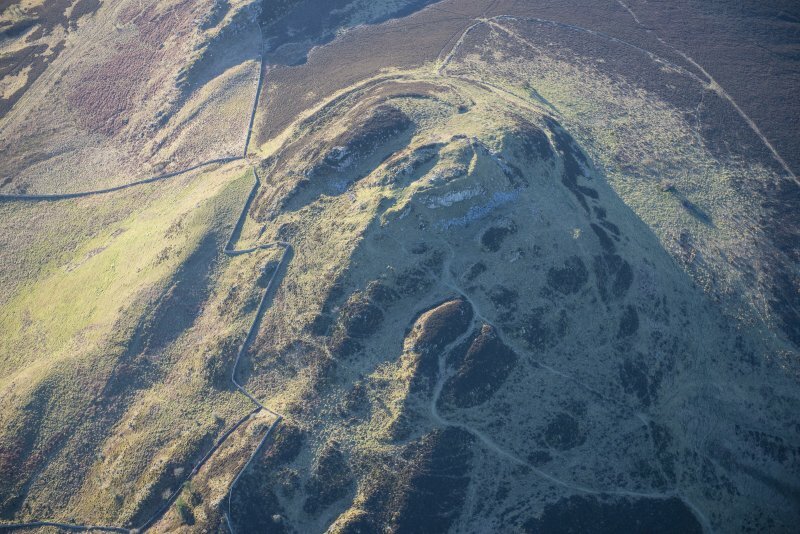 The citadel, which is defended by a single wall (A) drawn round the margin of the top of the summit, is roughly pear-shaped on plan with maximum internal measurements of 235 ft. from NE to SW by 105 ft. transversely. Although the wall is now reduced to a low mound in which one or two facing-stones can be seen, and its thickness is uncertain, the mass of fallen material at the foot of the cliffs on the NW and SE sides clearly indicates that it was of stone construction throughout, the core being solidly packed with small stones and faced on both sides with boulders. A narrow cleft known as "Peden's Pulpit" which runs from the top to the bottom of the summit at the SW end is not a practicable approach, and the main access to the citadel was on the NE where there is a well-defined entrance, 8 ft. wide, in the enclosure wall. Another gap in the wall, on the S side, from which a path descends obliquely to the plateau below, may likewise represent an original entrance designed to provide direct communication between the citadel and the annexe. SW and flanked by rocky outcrops. 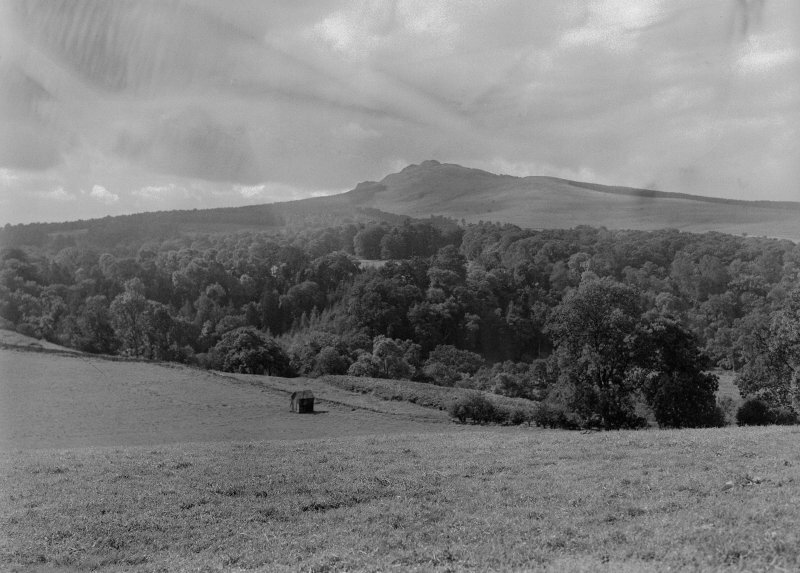 These outcrops are linked near their NE ends by a low mound at right angles to the hollow which was sectioned by Dr Curle in 1906 (A O Curle 1907) and was found to be composed of "loose stones heaped up to form a rampart." It was capped by a thick layer of soil containing only a few fragments of burnt bones, while fragments of unburnt bones were found in the bottom of the section. Other trenches dug at the same time in the hollow on the SW side of the mound and in a "well-defined hut-circle" (no longer visible) just inside the gap in the S side of the enclosure wall, produced no relics apart from scraps of charcoal and burnt bones, so that there can have been no lengthy occupation of the site. The annexe, which measures 300 ft. internally from NE to SW, is also enclosed by a single wall (B) similar in construction to that of the citadel. 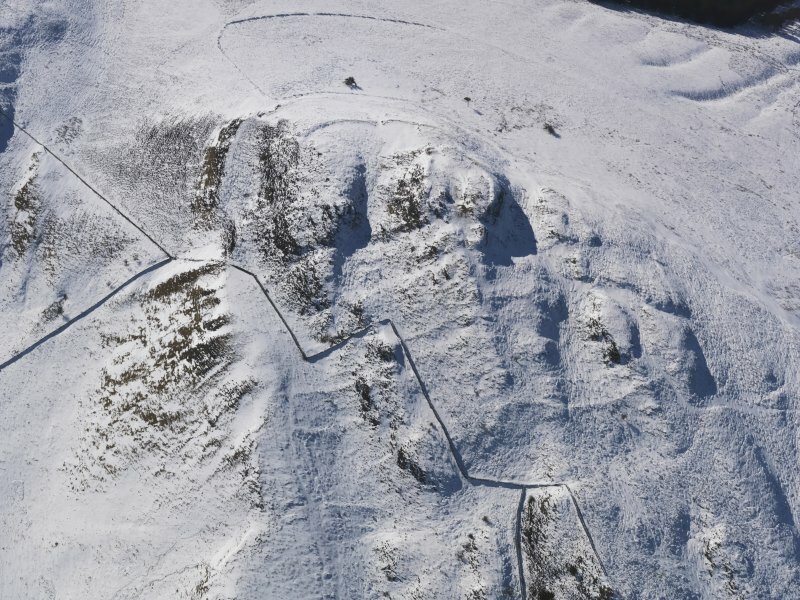 Starting at the base of the summit, 40 ft. N of Peden's Pulpit, the wall runs southwards in a gentle curve along the margin of the plateau: in this sector it is reduced to a stony mound not more than 18 in. high and retains only an occasional outer facing-stone. 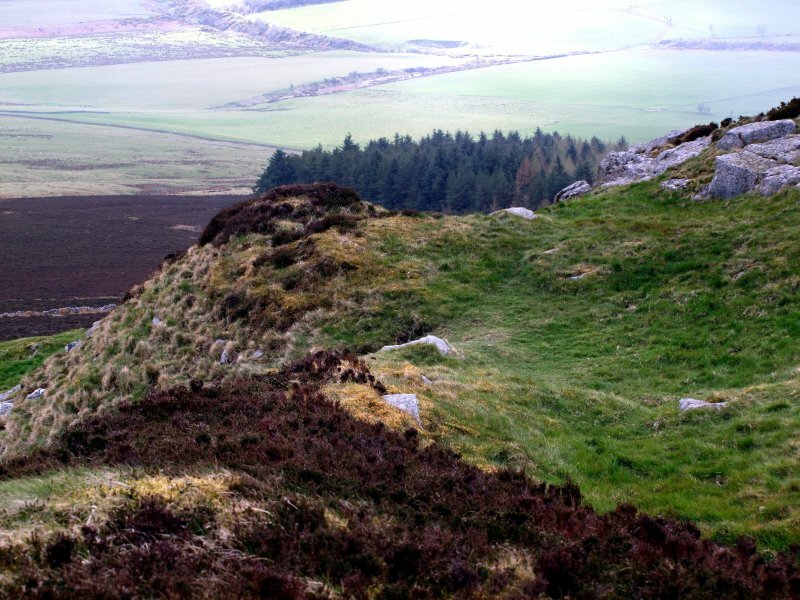 At the SE corner of the plateau the mound dies out, but the course of the wall can be traced north-eastwards by a crest-line along the outer foot of the ridge to the NE end, where the wall again appears running NW across the gully to the base of the rock face on the summit. In this latter sector the debris is several feet high and spread to a maximum width of 24 ft. The facing-stones, several of which appear to be in situ and indicate that the wall was some 12 ft. thick, measure up to 5 ft. in length and 2 ft. in breadth, while the core has again been formed entirely of smaller stones. At a distance of 14 ft. from the outer, or NE, side of this mass of debris, and running parallel to it, there is an irregular row of boulders set on end. The only visible entrance to the annexe is in the centre of the SW side at the head of a hollow track which climbs the hill obliquely from a point just inside the outermost rampart on the terrace. The interior contains no sign of structures. 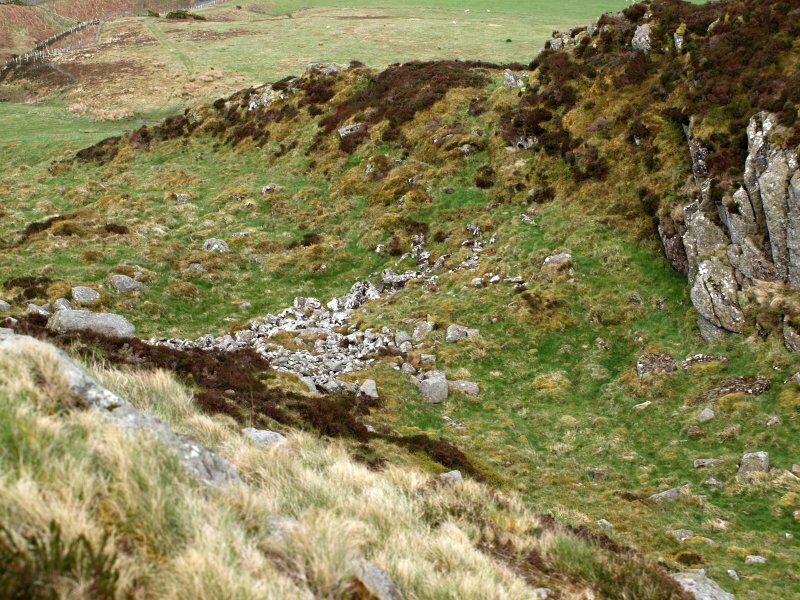 The two wasted fragments of walling situated below the citadel on the N and NE sides, one of which (C) lies obliquely across a gully while the other (D) runs along the top of a low line of crags, doubtless represent the remains of contemporary outworks designed to protect the main entrance, which would otherwise be exposed to sudden attack from hostile forces assembled under cover of the rock outcrops on these sides. As Dr Curle pointed out, a distinctive feature of the annexe and citadel walls is their abundant use of Roman dressed sandstone blocks in both core and face. 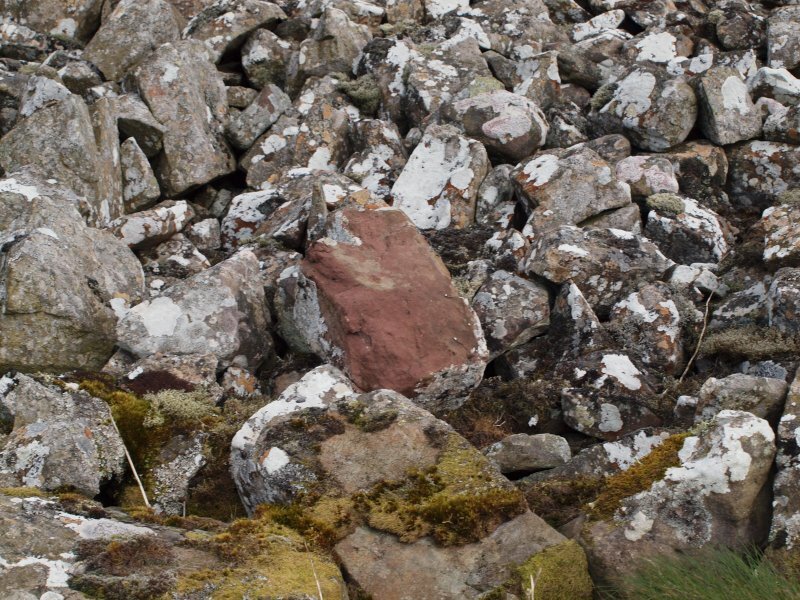 These stones, over 30 of which were counted on the date of visit, are found so low down in the ruined walls that they must have been incorporated in these walls from the outset and not inserted during a subsequent reconstruction. There can therefore be no doubt that the native fortress represented by the citadel and annexe is of post-Roman date. In view of the unlimited amount of loose boulders and easily quarried rock outcrops available on the hill-top, the utilisation of Roman masonry can only be explained on the assumption that the structure from which it was obtained was situated within or adjacent to the area covered by the later fortress. And a Roman building in this position can only have been a signal-station. 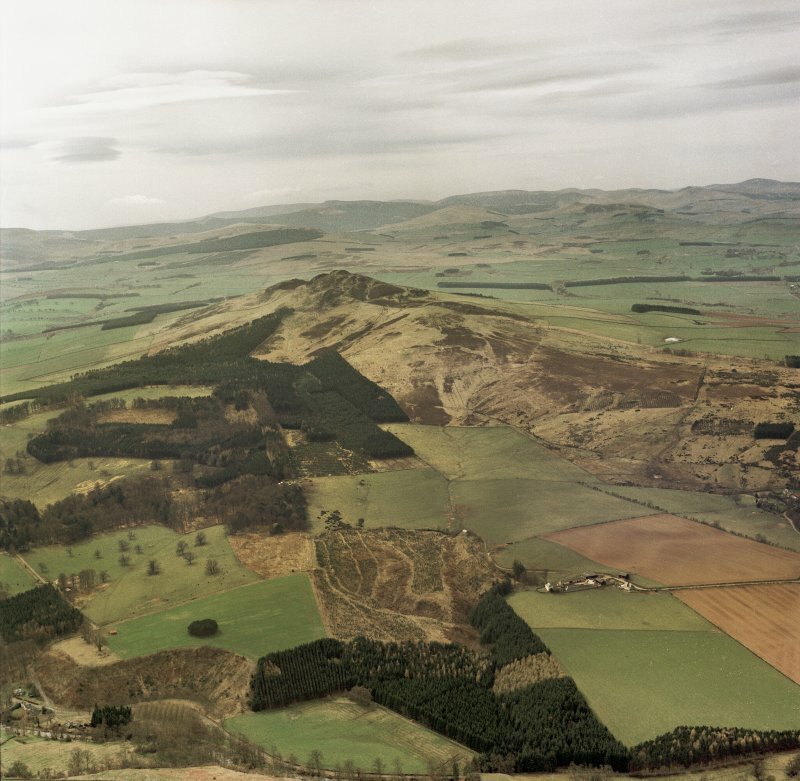 Roman relics found on the hill comprise: a "first brass" of Vespasian, the exact find-spot of which is not recorded (G Macdonald 1939); a hoard of bronze vessels found on the SE side, 400 ft. below the summit, in 1863 and now in the Hawick Museum; and two bronze coins, one of which is said to have been of Maximinus, found on the farm of Hallrule at the SE foot of the hill (A O Curle 1905). In contrast to the fortifications already described, which use the rock outcrops as an integral part of the defensive line, the outermost wall (E) follows an even course round the hill at approximately the same level. This wall, which encloses an area of about 7 acres, has been of boulder-faced rubble construction but is so much ruined that it is difficult to follow in places and it is entirely lost for a distance of 350 ft. on the E side. There is a well-marked entrance on the S, approached by a hollow track, and two possible entrances on the N where the wall is interrupted by natural gullies. It is noteworthy that no Roman masonry is visible anywhere on the circuit or amongst the masses of stone that have fallen from it at certain points, particularly on the N side; and this fact, coupled with its position on the shoulder of the hill, might well suggest that it represented a fort or an oppidum of Early Iron Age date. On the other hand it is just possible that it is the wall of a cattle compound coeval with the Dark Age fortress. Two rectangular enclosures situated on the E flank of the hill, just outside the presumed line of wall E, are probably of comparatively recent origin. They were trenched by Dr Curle but produced no sign of occupation. R C Bosanquet 1928; J Curle 1932; RCAHMS 1956, visited 1949. "... Rubers Law (No 145), where the circumstances are not so clear but where a case can be made out for supposing that there was a large contour-fort, probably of rampart construction, enclosing the greater part of the hill, and that this was later occupied, in succession, by a Roman stone building on its summit, and a Dark Age 'nuclear' fort embracing the crags of its northern end." Rubers Law belongs to the Dark Age 'nuclear' type of fortification. NT 58031557. As described and generally as planned by the RCAHMS. The bronze vessels found in 1863 are still at Hawick Museum, but the present location of the other finds was not ascertained. Photographed by the RCAHM 1980. Two stones dressed with diamond broaching found on the summit of Rubers Law by A O Curle are in Wilton Lodge Museum, Hawick (HAKMG 4160). 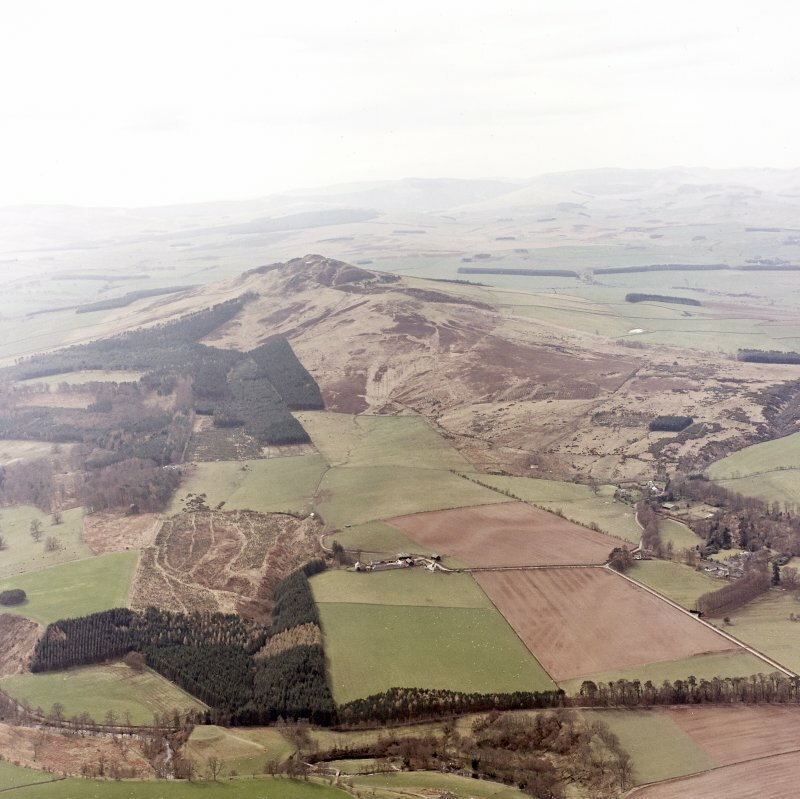 After Eildon Hill North, Ruberslaw is the most prominent hill in Roxburghshire-isolated, imposing and with fine views to the Cheviots, the Eildons, the Lammermuirs, the hills of Selkirk shire and Liddesdale. 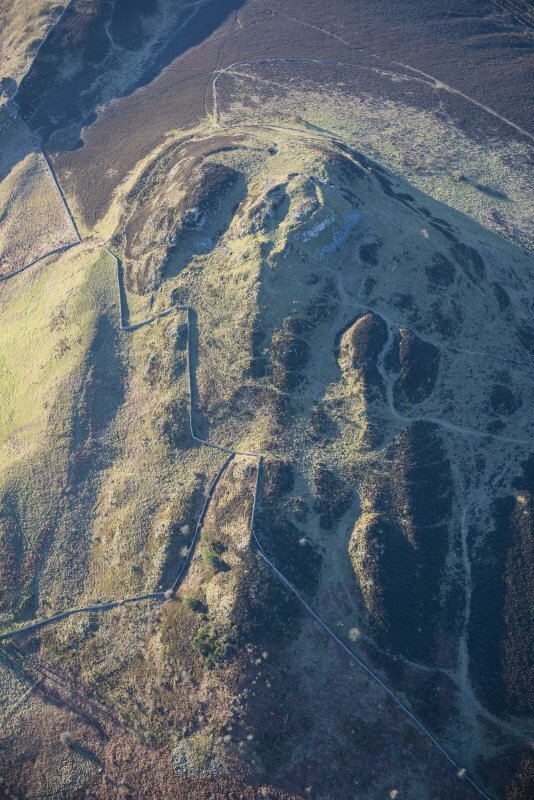 Nearly 427m high, its igneous summit is crowned with a fortified settlement, supplanted by a later enclosure. 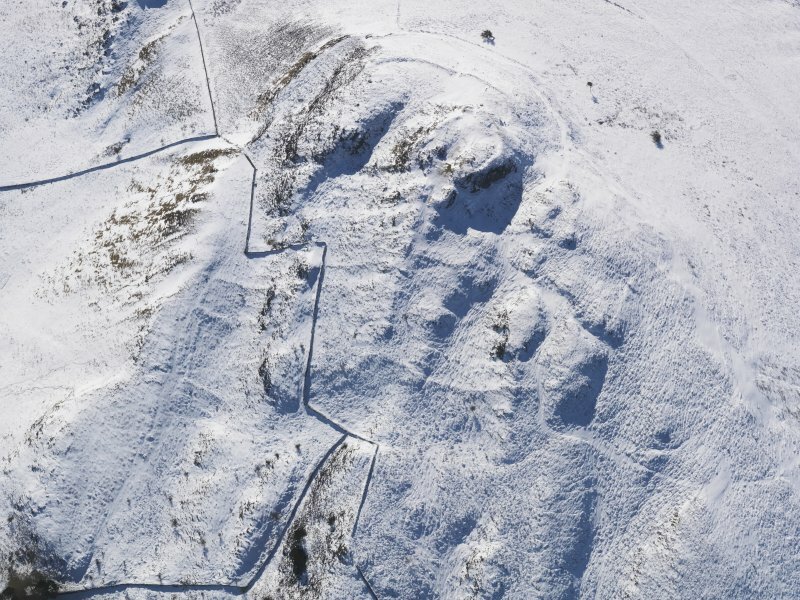 This later, single stone wall encircling only the actual summit has an annexe to the south; it incorporates dressed stones sometimes suggested as Roman because of their diamond-shaped chiselling and re-used when the site was reoccupied by a British community, perhaps in the 4th or 5th century AD. 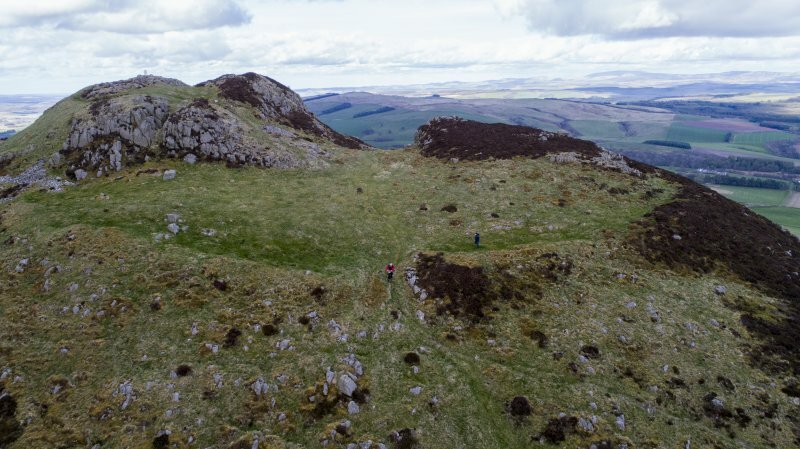 These structures make considerable use of rocky outcrops as an integral part of their defences; the earlier wall or rampart, by contrast, follows a roughly even course around the hill, well below the summit, enclosing nearly 3 ha in all. It is of boulder-faced rubble build, though over 100m is lost on the east side. There is a well-marked entrance on the south side, approached by a hollow track; two other possible entrances on the north make use of natural gullies. 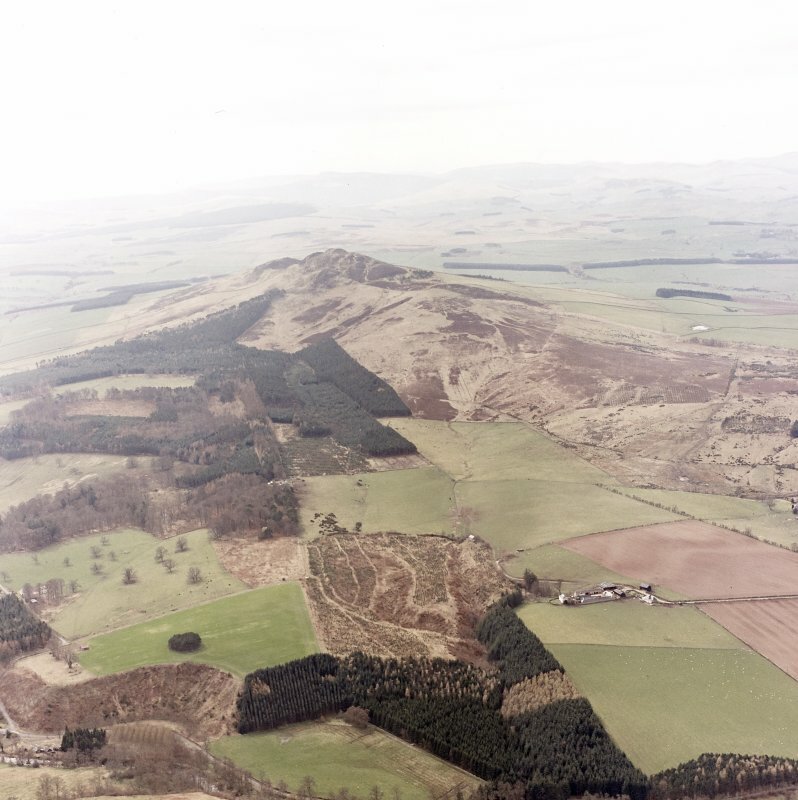 This then is a pre-Roman hillfort large enough to be one of the minor centres of the Selgovae whose capital was probably on Eildon Hill North (no. 84). 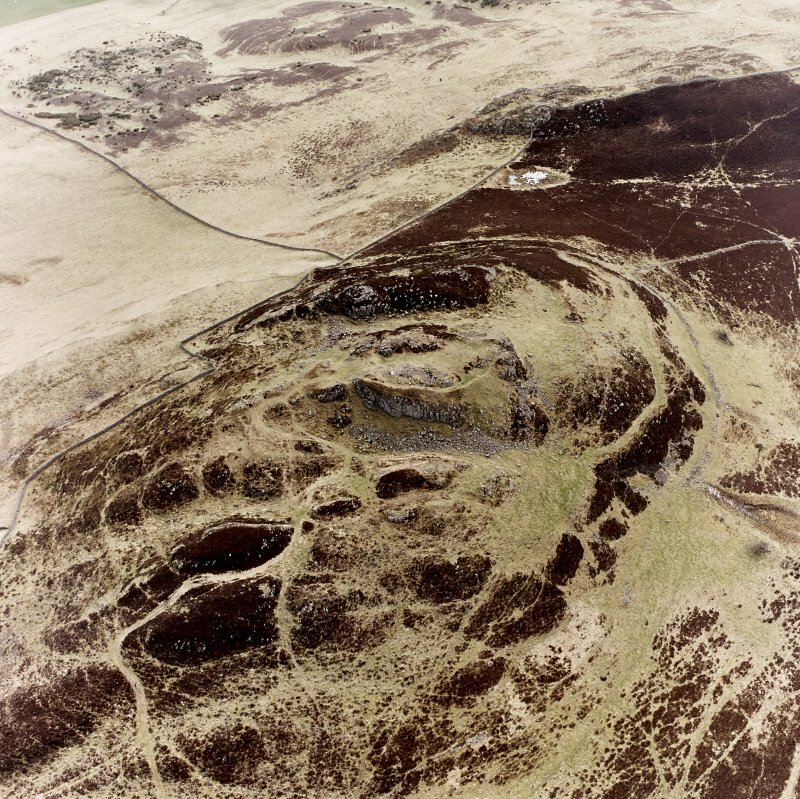 About 4km south-south-west, Bonchester Hill fort (NT 594117) shows a similar history. South of Ruberslaw and west of Bonchester Bridge, either side of the A 6088, there are wide expanses of old cultivation rigs. Fairly straight, low and roughly parallel, they are unlikely to be much older than around AD 1800. Their survival is an indication of the retreat of arable cultivation from some of the higher lands; it also well illustrates the pre-improvement pattern of ridge and furrow cultivation-a necessary form of natural drainage as well as a basic working unit. The chronology and affinities of Rubers Law fort remain matters of considerable complexity and significance. 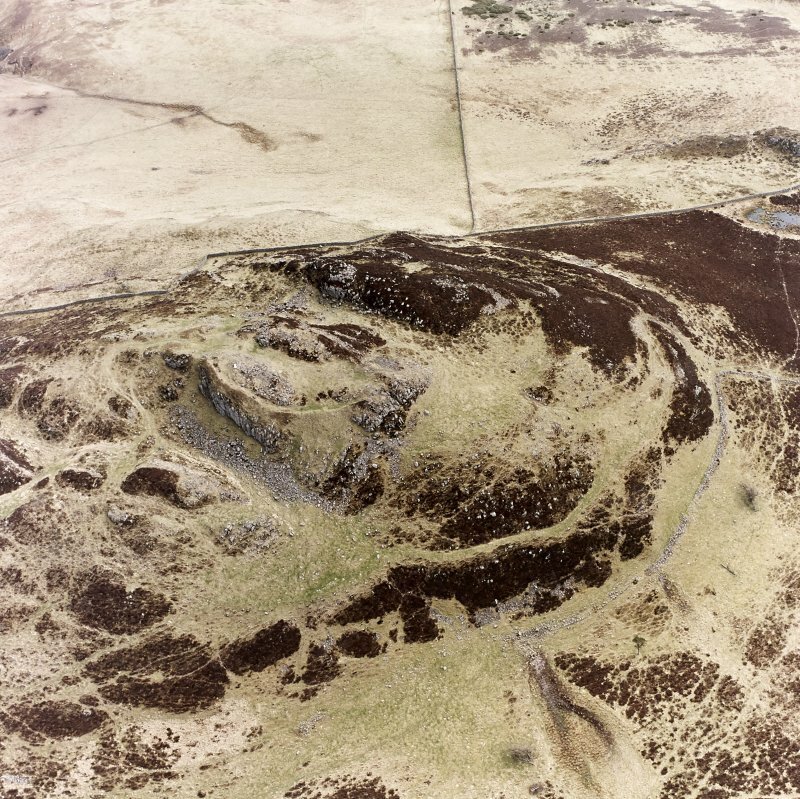 Stevenson (1951, 194-5) considered it a ‘nuclear fort’ of putative early Historic date, comparable with others, notably Dunadd (NR89SW 1.00), of recognised historical significance. He noted that ‘For the post-Roman date of the walls of Ruberslaw we have the unmistakable evidence of Roman dressed stones built into them’ (as was earlier noted by Curle). Information from RCAHMS (RJCM), 20 October 2011. R B K Stevenson 1951; RCAHMS 1956; R W Feachem 1963; R W Feachem 1965. 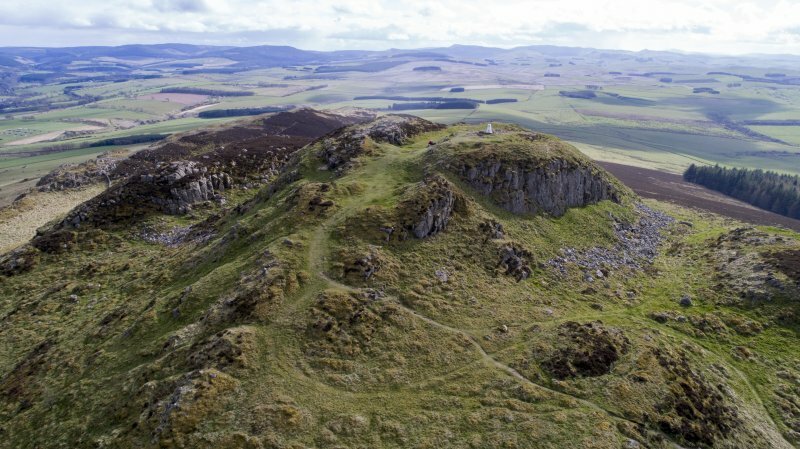 A complex fortification encloses the summit and upper slopes of Rubers Law, a rugged and distinctive landmark between Jedburgh and Hawick. 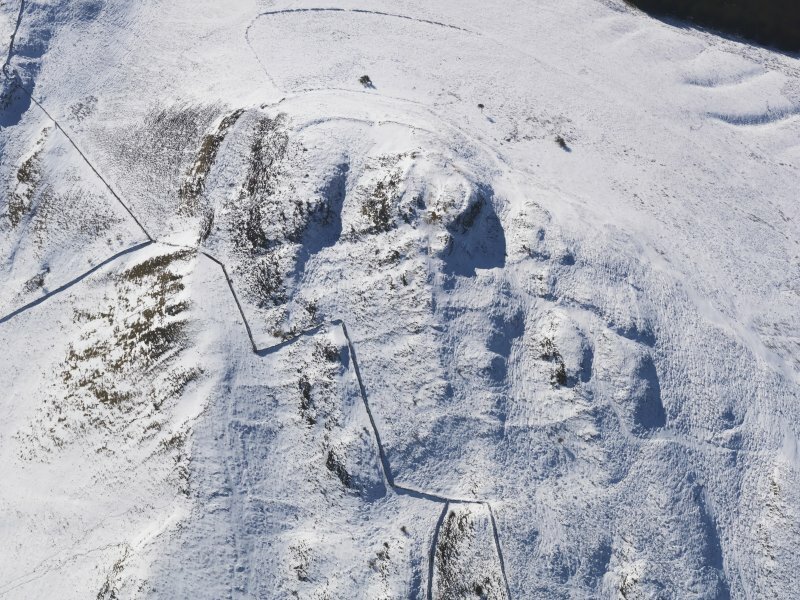 The principal remains can be divided into two elements; a citadel enclosure on the summit, with an annexe taking in a terrace and a rocky ridge on the SE; and a large outer enclosure contouring along natural terraces lower down the slope. 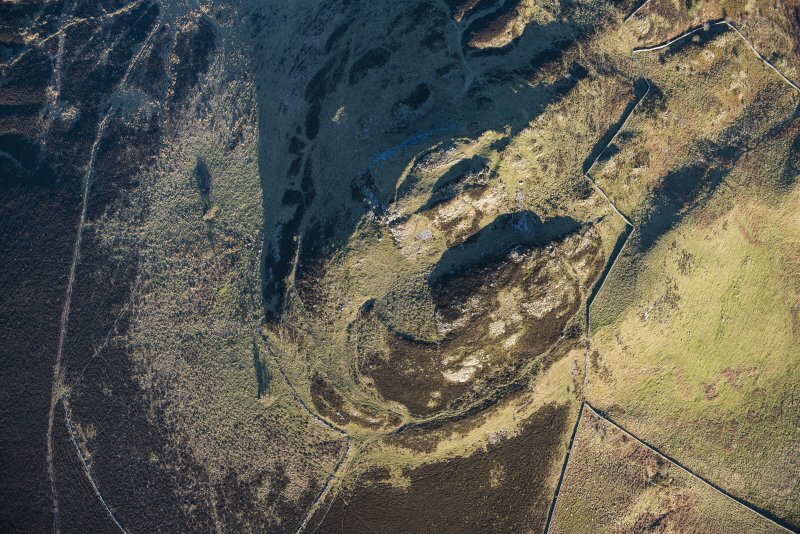 The citadel is enclosed by what has been a substantial wall extending round the craggy lip of the summit and measures internally about 72m from ENE to WSW by a maximum of 32m transversely (0.18ha). There is a well-defined entrance at the ENE end, and a possible second at the W end of the SE side, from which a path drops obliquely down the slope into the annexe; the wall at the WSW end is also pierced by a narrow cleft in the rock face known as Peden's Pulpit, but RCAHMS investigators in 1949 did not think this provide a practicable route to the summit. 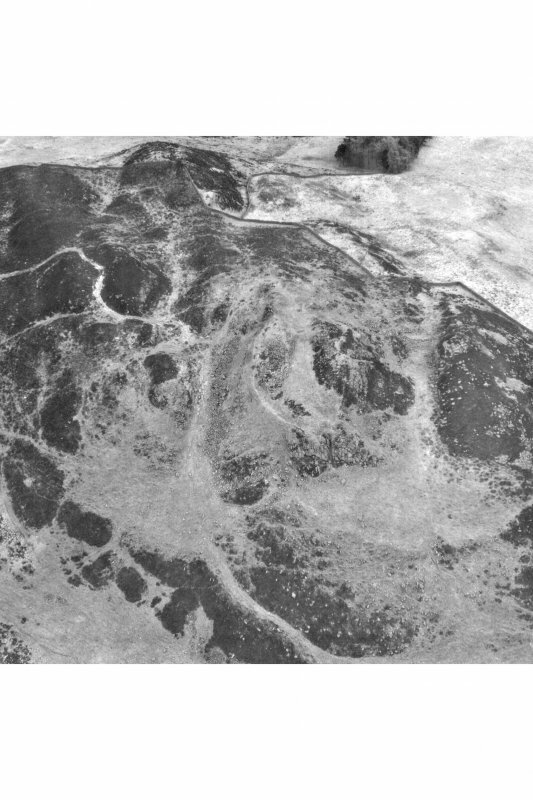 Apart from a mound towards the ENE end of the grassy hollow between the rock outcrops forming the summit area, the interior is featureless; Alexander Curle dug into this mound and beneath a deep layer of soil found a loose heap of stones which he believed was the remains of a rampart, and he also found what he described as a well-defined hut-circle elsewhere (Curle 1907). The wall of the annexe springs from the foot of the summit on the SW and swings round the leading edge of a terrace and along the flank of a rocky ridge to return across a gully at the foot of the summit on the SE. Internally it measures about 90m from ENE to WSW by between 80m and 35m transversely (0.5ha). 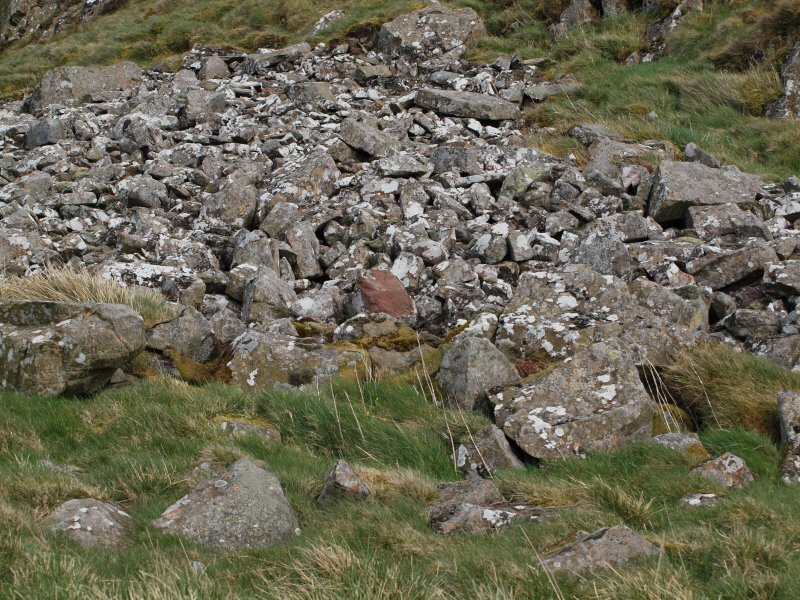 Its wall is largely reduced to a stony scarp, but where it crosses the gully on the E it forms a mound of rubble about 7m in thickness by 0.6m in height and the massive surviving facing-stones indicate an original thickness in the order of 3.6m; another row of upright stones can be seen 9m in front of the wall in this sector. An entrance on the SW is approached by a hollowed trackway. A notable feature of the walls of both the citadel and the annexe is that they incorporate dressed sandstone blocks which almost certainly derive from a Roman structure, speculated to have been a watchtower on the summit. Several other fragments of walling can be seen to the N of the citadel, which are possibly the remains of outworks controlling access up to the entrance on the ENE. Lower down the slope, however, there are the remains of a heavily ruined rampart contouring round the slope on all sides except the E, essentially following natural terraces and shoulders to form an enclosure of about 3.7ha; an entrance on the S is approached by a hollowed trackway mounting the slope obliquely to expose the visitor's left side, while other entrances possibly utilise two natural gullies on the N .
Rubers Law, which is situated about 5 miles (8km) south-west of Jedburgh and 4 miles (7km) east of Hawick, is one of the most distinctive hills in the Scottish Borders. 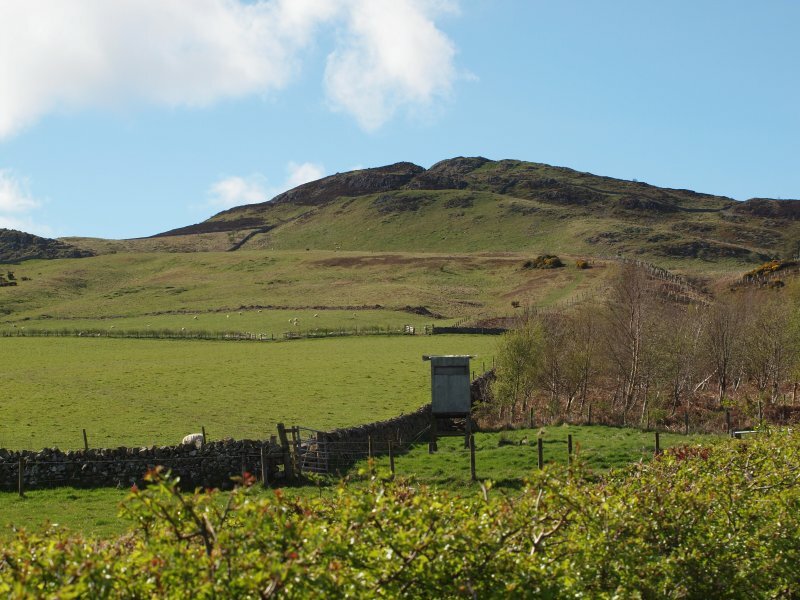 Rising steeply to almost 425m (1400ft) above Teviotdale, its lower flanks are formed of old red sandstone, while its lofty, rocky summit is composed of igneous rocks. 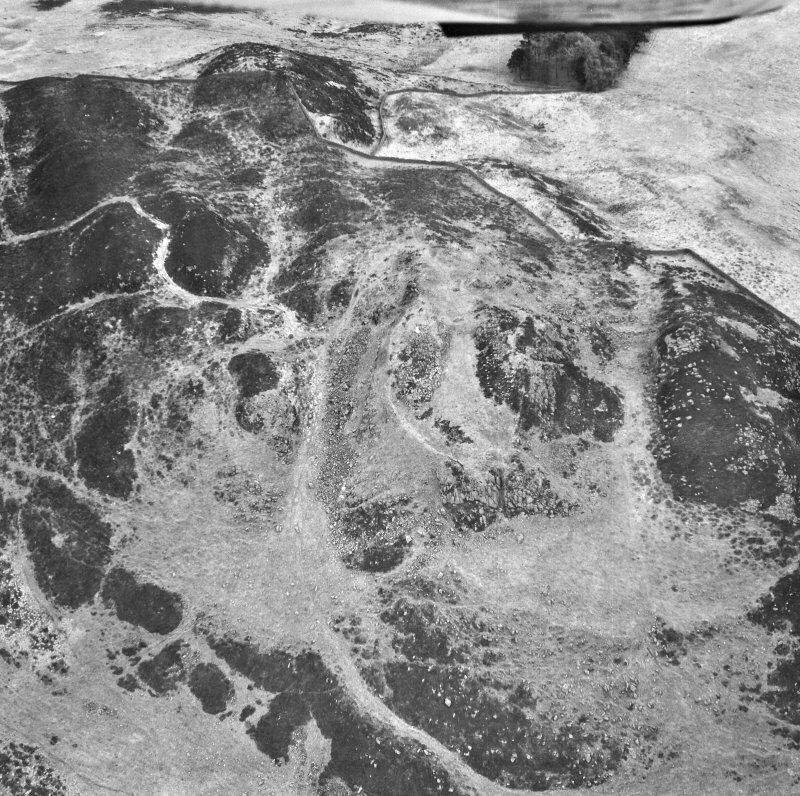 These influence the land-use, with the improved ground around its broad, expansive skirt gradually giving way to a sourer, rougher pasture at higher elevations until the summit is reached, where there is very little vegetation to clothe the sharp ridges, deep gullies, small plateaus and screes. 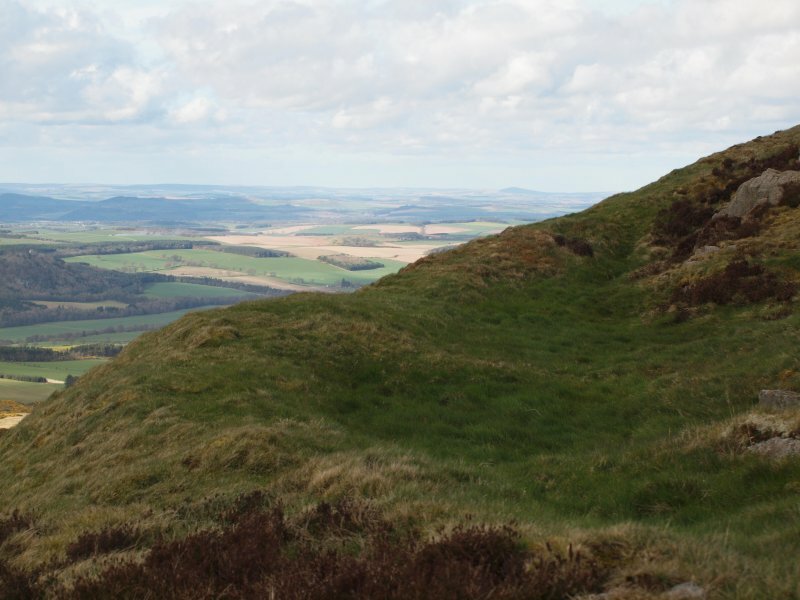 From here the landscape far below unfolds to reveal the familiar silhouettes of the Eildon Hills and the Lammermuirs to the north, the Cheviots to the east and south and the hills of Selkirk, Roxburgh and Dumfries far away in the distant west. 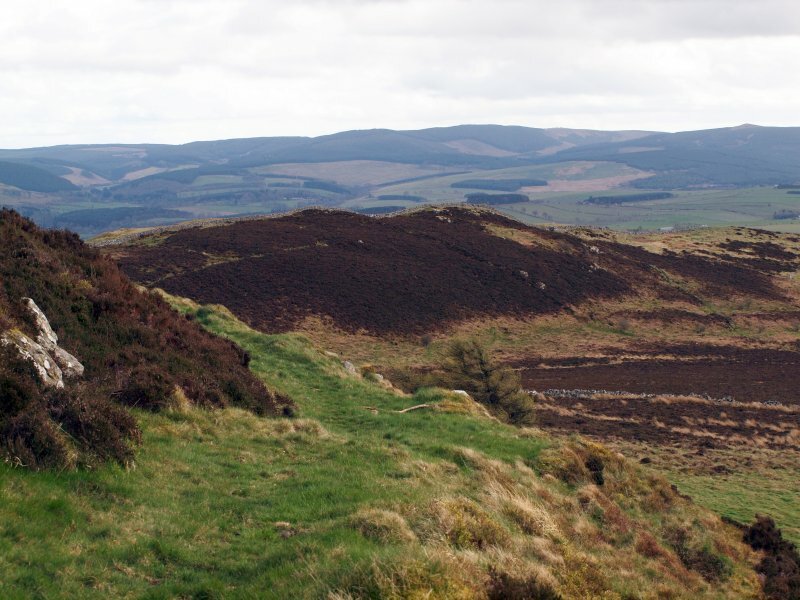 There are ancient remains on the upper slopes of Rubers Law. In making an ascent from the north, the west, or south, one first encounters a discontinuous, grass-grown, natural terrace upon which there is the tumbled debris of a discontinuous, boulder-faced wall, which encloses almost 3 ha (7ac). 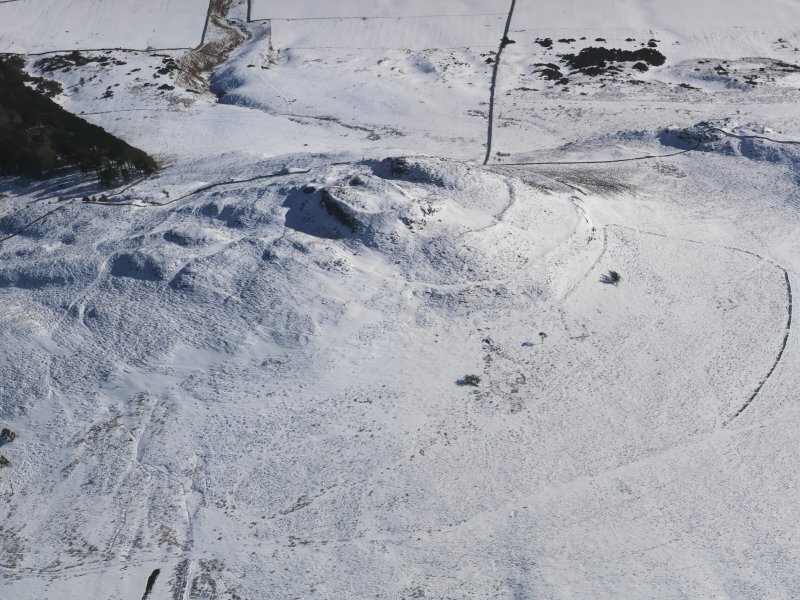 This is an Iron Age fort. There are two entrances on the north, where gullies offer an easy approach and another on the south. Much of the broken ground the fort encompasses consists of the rocks that outcrop immediately below the hill’s bare summit. These support the remains of further collapsed walls looping from outcrop to outcrop. 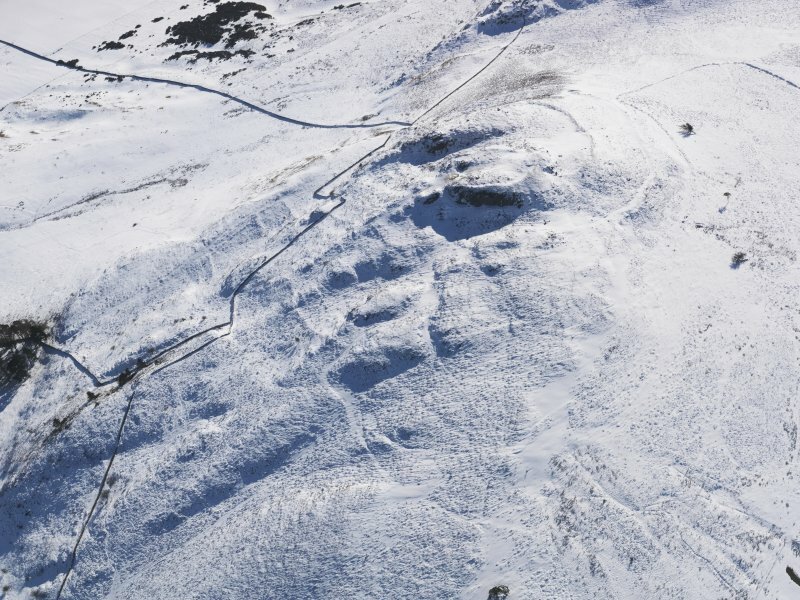 Although it can be difficult to perceive their overall plan, these curling walls define a roughly oval enclosure interrupted by a deep gully on the hill’s peak, while lower down on the south, there is a roughly rectangular plateau that also incorporates a gully. 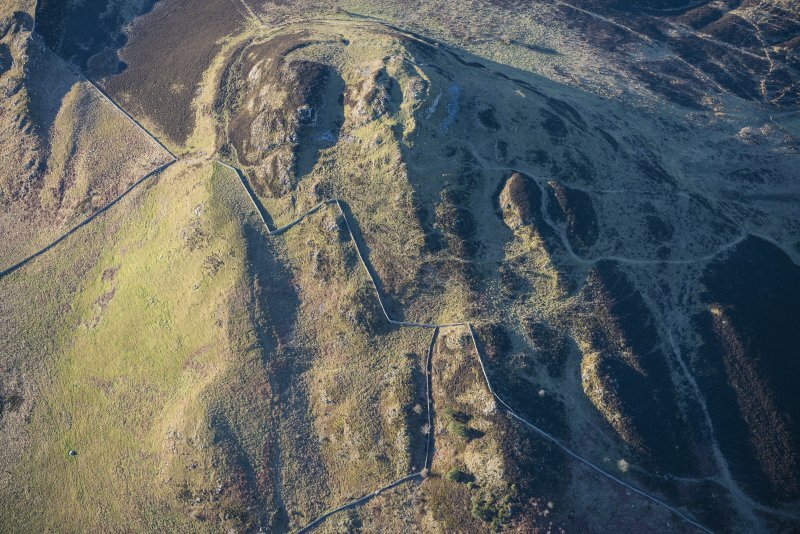 There is an entrance on the east-north-east providing access to the oval enclosure on the summit, the approach to which is controlled by the natural configuration of outcropping rocks to the north, which are reinforced by further lengths of walling. A narrow path descending from the south-west of the oval enclosure provides a link with the plateau below. 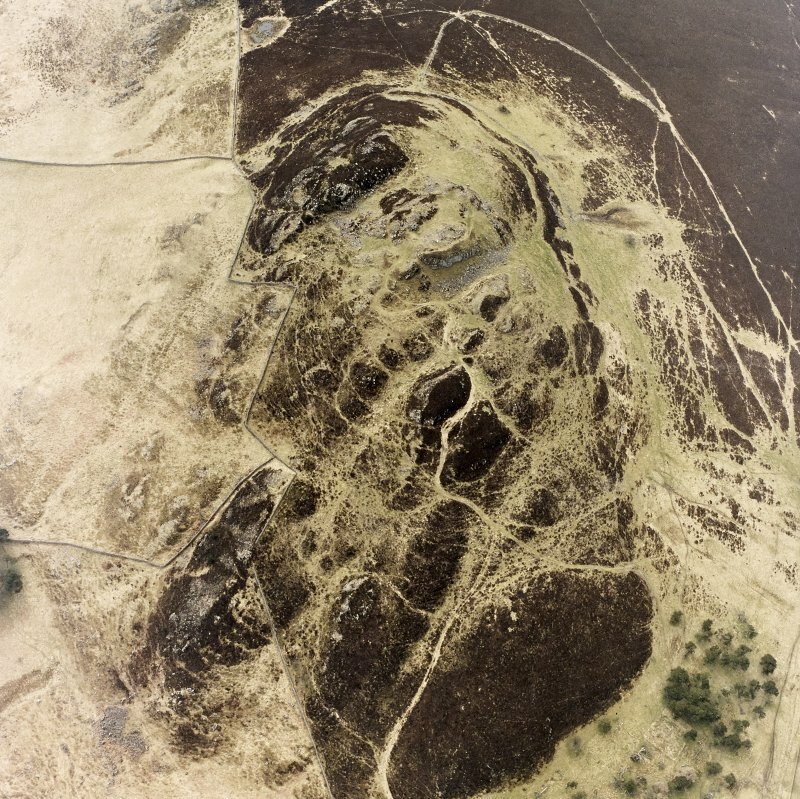 These remains were first recognised by Alexander Curle at the beginning of the 20th century, who also made a startling discovery. The walls forming the enclosure and plateau consisted for the most part of the grey igneous rocks outcropping on the summit, but their lower courses also included sporadic, neatly-shaped rectangular blocks of pale red sandstone, some of which displayed ‘diamond-broaching’ – a criss-cross pattern scored into one surface that is characteristic of Roman work. Others exhibited herring-bone patterns, while some appeared to have formed sills or lintels. Curle concluded that these could only have been robbed from some abandoned Roman building that had once stood in the immediate neighbourhood. 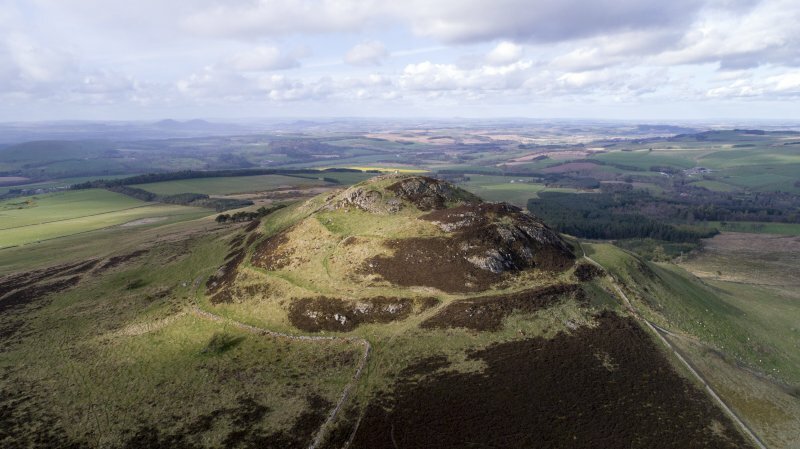 He also noted that their incidence clearly demonstrated that the fortifications around the summit (embracing the oval enclosure, its outworks to the north and the rectilinear plateau) could only have been constructed after the Romans had left Scotland. The blocks had been re-used as raw material in the construction of a new stronghold that had been built perhaps several hundred years after the abandonment of the Iron Age fort. Nevertheless, the location of this lost Roman building in such an exposed and hostile environment was a puzzle. While they could have been robbed from a military post situated on the lower flanks of the hill, Curle could find nothing to support this. Instead, he surmised that the edifice must have stood upon the summit, ‘from whence a most extensive prospect would make it suitable for a post of observation, or for a signalling station’. 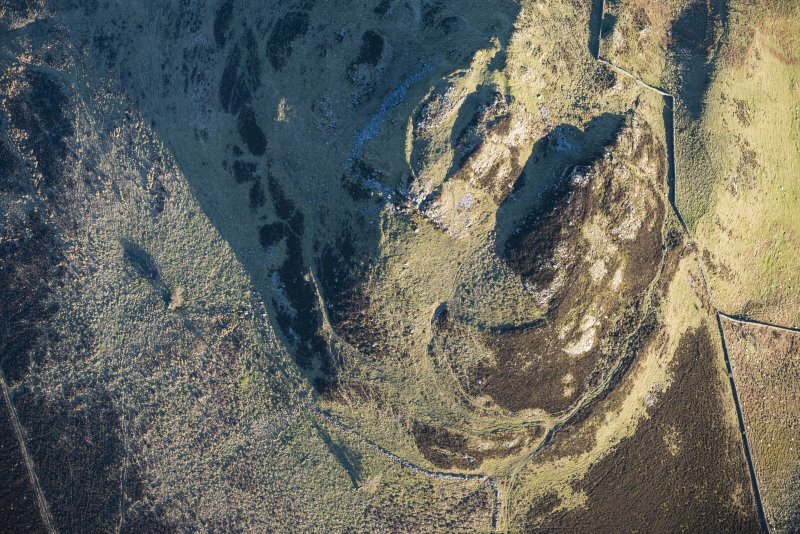 This idea was subsequently developed by Professor J. K. St Joseph of Cambridge University, who in the latter part of the 1940s discovered from the air the remains of a small Roman fortlet on the flanks of Brownhart Law in the Cheviots. 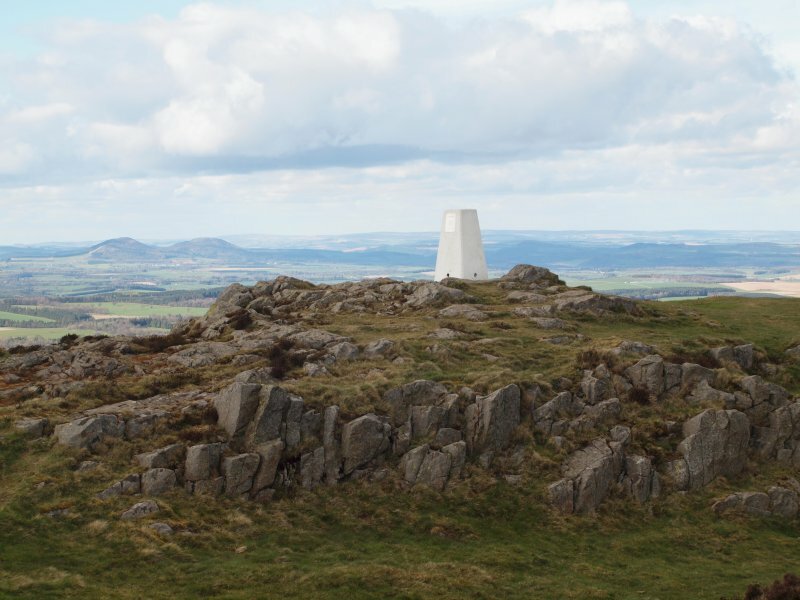 Impressed by the extensive view to the north where Rubers Law dominated the centre-ground, he concluded that this must have been used for long distance signalling, with both sites forming part of a system exerting control over Southern Scotland. 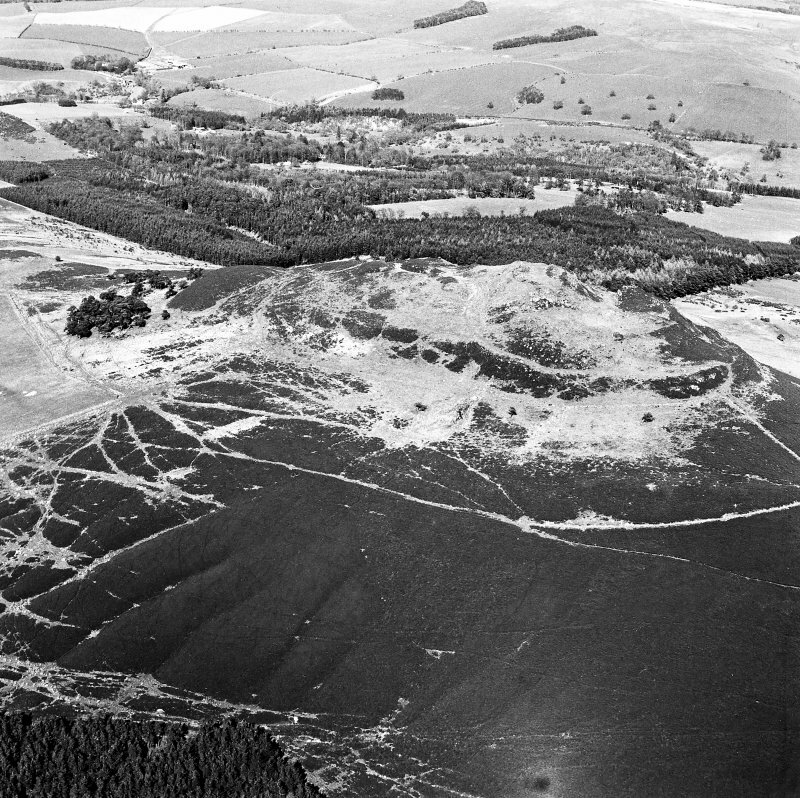 In the next few years, further weight was added to this hypothesis by the discovery of the earthworks of a possible timber watchtower on the summit of Craik Cross amongst the mountains far to the west, while those of another was recognised on the top of Eildon Hill North, sited immediately above the Roman fort of Newstead – the most important military post in the region. However, it is now generally accepted that long-distance signalling would have been impractical and an explanation for the Roman stonework at Rubers Law still remains elusive. While the blocks could derive from a stone watchtower with a much more local remit, it is also possible that they originate from a shrine or some other kind of landmark.